The lights go down, thumping music plays and a young woman on a bike at the front of the class encourages students to spin faster and harder. When the lights go back on, the students on the bikes pull out their notebooks, and it's clear that this is not SoulCycle. 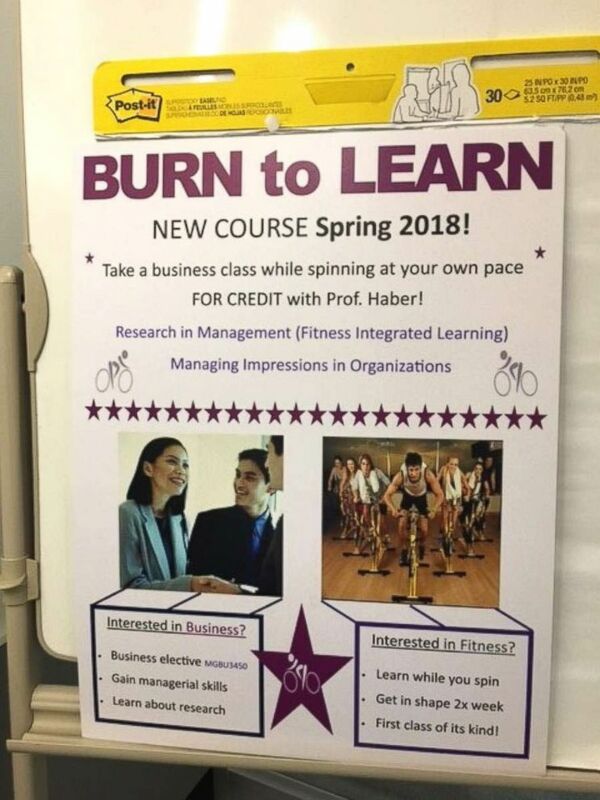 Instead, it's a first-of-its kind business school course at Fordham University that is taught on spin bikes in a university gym. The class is generating considerable buzz on campus. Students listen to a lecture during a business course at Fordham University. "It’s the first class that I mention to anybody when anybody asks me what classes I’m taking," said Amanda Vopat, 22, a business administration major. "I think people are really excited about it." She added, "It feels like I’m in a real spin class and getting a really good workout." The 75-minute, twice-weekly course is the brainchild of Julita Haber, a business school professor at Fordham. "I have been introducing movement and fitness in my classes for the past seven years," she said. 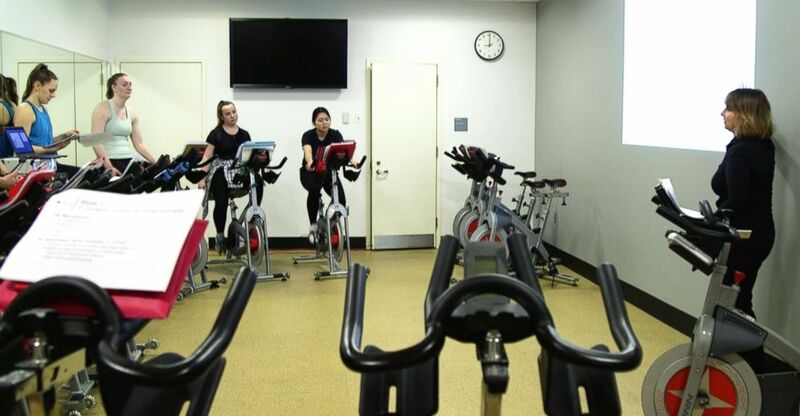 "I found the spin class would really allow students to exercise at their own leisure while a professor lectures at the same time." The course the students are taking while simultaneously cycling is no joke. Research in Management: Managing Professional Relationships is an upper-level business school course taken primarily by juniors and seniors. 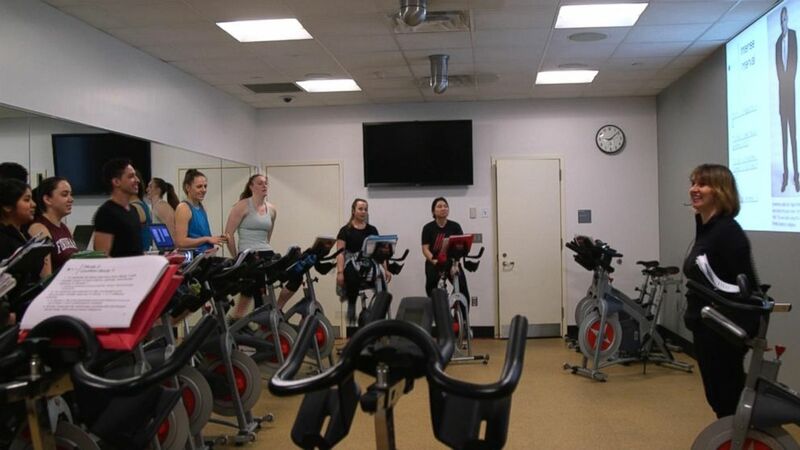 Fordham University offers a first-of-its-kind business course in the university's spin studio. The students are fully instrumental in each class, selecting the music, leading stretches before and after class and leading the intervals during the class. Haber stops her lecture every 20 minutes throughout the class. While one student turns off the lights, another student turns up the music and a third student goes to a bike in the front of the class to lead their classmates in a high-intensity interval that lasts two to three minutes, just enough to re-energize the students. "It's a fantastic way of engaging students and as a professor, as a teacher, that's really gratifying," she said. "They don’t have their cellphones, and they don’t have laptops so they are physically engaged and also mentally engaged in what is being said." The course is the first of its kind at Fordham, and Haber believes it is also a first across the United States. She has authored research on the unique classroom approach, which she calls fitness integrated learning. 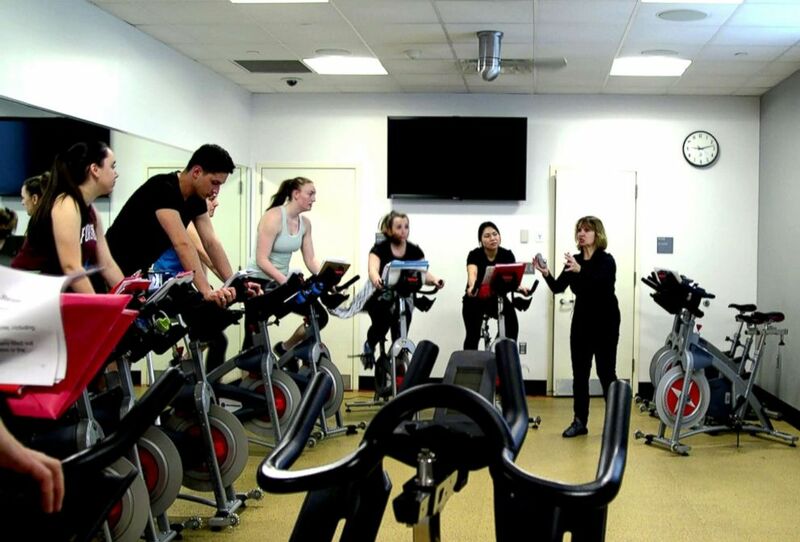 Fordham University professor Julita Haber teaches a business course while students are on spin bikes. 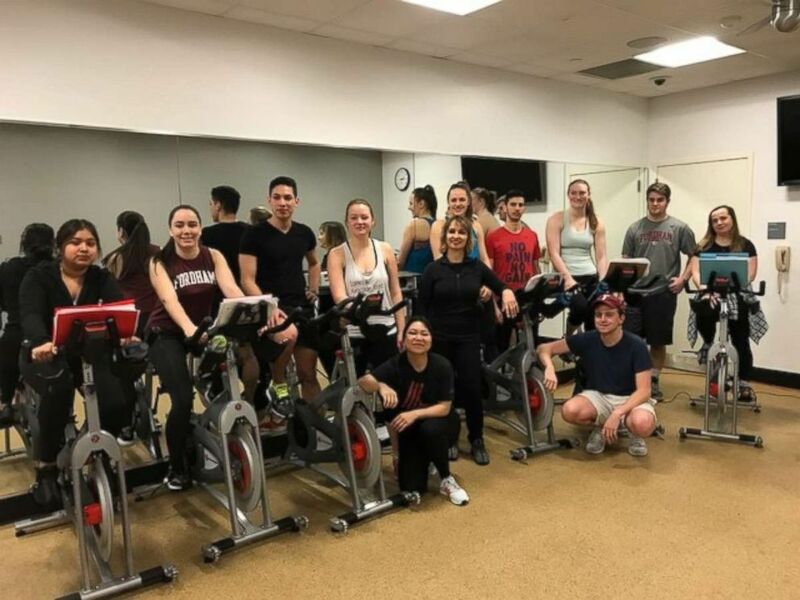 Fordham's business school, which has 2,400 undergraduates, welcomed Haber's idea to teach a business class on spin bikes. "It’s this point that keeps coming up that interactive learning and interactive classroom environment is really essential for today’s student," said Donna Rapaccioli, dean of Fordham's Gabelli School of Business. "We recognize that this generation is really looking for this type of engagement and there’s no room for complacency." Rapaccioli described students as "energized" about the class and said Fordham is open to expanding it to other courses. 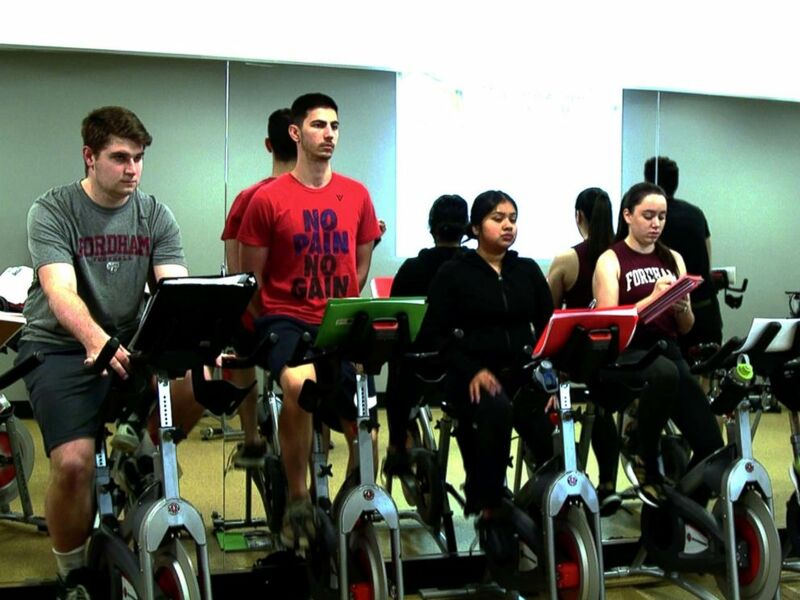 Fordham University offers a first-of-its-kind business class in the university's gym. "Absolutely," Rapaccioli answered when asked if Haber's course represents the future of learning. Haber's inspiration for incorporating fitness into her lectures comes from her own experience of trying to learn in a traditional lecture format. Professor Julita Haber spins with students at Fordham University. "I myself am very hyper. I personally cannot sit for hours and hours," she said. "I was spinning while I wrote my dissertation, so while I started to slowly integrate movement into my classes, I tested spinning [with students]." The course has also had the extra bonus of getting students engaged in exercise. "I’m not a big gym or exercise person so I wanted to change that and I think this class has helped me do that," said Anthony Nugent, a 21-year-old junior. "A lot of people don’t think [the class] is actually a real thing. They’re very surprised to hear."